All turacos have head crests. The white crested turaco is quite distinctive. The face is jet black, but the whole neck area and the tufted head are pure white. The lower body is light green and the wings are violet with a long charcoal tail. The range of the white crested turaco is a narrow strip of Central Africa from Nigeria across Chad and Cameroon into Sudan and Zaire. 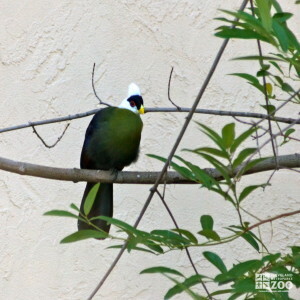 The habitat of the white crested turaco is humid forest edge to open woodland to acacia shrub. They are tree birds. Breeding is late spring into summer. Takes 22 days. White crested turacos start feeding often at dawn and then with preening tree breaks, continue eating until time to roost. Male and females commonly pair up and engage in small flocks but they are territorially expressive. Each pair defends its space. A breeding pair of white crested turacos establishes a flat nest of twigs 5 to 20 meters up in trees. After performing their mating dance, the female lays the eggs and both sexes raise the young.